The PDMS/PTFE adhesive in action. Sticking different material surfaces together is vital in a huge range of applications from electronics to biomedicine, but finding an adhesive that works instantaneously under damp or wet conditions is difficult. 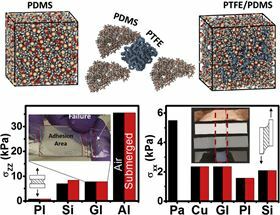 But now a team of researchers believes that they have come up with a universal adhesive that works in both air and underwater [Chipara et al., Materials Today Chemistry 9 (2018) 149]. The adhesive is a simple mixture of equal amounts of liquid and solid polymers, says Chandra Sekhar Tiwary of Rice University and the Indian Institute of Technology, who led the research along with Pulikel M. Ajayan and colleagues at Penn State University, Bruker Nano Surfaces, State University of Campinas in Brazil, University of Texas-Rio Grande Valley, Baylor College of Medicine, and the US Army Research Laboratory at Adelphi. When mixed together, liquid polydimethylsiloxane (PDMS) infiltrates between the solid particles of polytetrafluoroethylene (PTFE), which are around 200 nm in diameter, binding the two polymers together. “The strong electronegativity difference at the interface between the two polymers, mainly between fluorine atoms in PTFE and hydrogen atoms in PDMS, induces strong and reformable dipole-dipole interactions responsible for the cohesion between the two materials,” explains one of the authors, Thierry Tsafack of Rice University. The chemical affinity between the two polymers binds them together regardless of the conditions unlike many other adhesives, which rely on surface patterning, chemical cross-linking or surface modification and are adversely affected by moisture. Moreover, the large electronegativity difference induces dipole-dipole interactions between the two polymers, which enable the adhesive to be reused multiple times. The liquid component of the adhesive wets surfaces very effectively to maximize the surface area available for the interfacial chemistry between the two components to take place and eliminates the need for curing time. The approach works well with a wide range of both similar and different materials from glasses, metals, and ceramics to paper and biomaterials. The resulting mechanical properties of the joints are impressive, too. This simple, effective and reusable adhesive could be immediately practical for a range of applications from electronics to medicine, particularly the latter where it could provide rapid adhesion between biological materials. “Currently, we are not aware of any downsides the adhesive might have [and] biomedical companies [are already] showing interest for medical applications,” adds Tiwary. Replacing metallic nanoantennas with silicon ones for perovskites in solar cells. Because it changes from a solid state to a liquid state at around 30°C, gallium can make an effective reversible adhesive.